From left to right: a Nordic, a Reptilian, and a Grey engage in a high stakes game of interdimensional cards. Illustration by Jeremy Kai/Torontoist. When budget cutbacks forced the Search for Extraterrestrial Intelligence Institute (SETI) to shut down its Allen Telescope Array earlier this year, it marked the end of an era of publicly funded alien eavesdropping. But for many in the UFO community, ET already walks among us. On a recent Saturday at the Richview Library, UFO specialist Chris Russak and psychic channeler Charlie Kundallini led a group of local paranormal enthusiasts on a whirlwind tour through the alien kingdom. Turns out our understanding of ET has come a long way since the dark days of Mork and Marvin the Martian. The burgeoning fringe science of alien taxonomy has grown so rapidly in recent years, you’d be forgiven for not keeping up. Here’s a little primer to get you up to speed. Greys: Grey-skinned and glassy-eyed, these are the aliens you’ll most often see on the silver screen, which is surprising because by most accounts they’re hideous. According to Russak, Greys reproduce via cloning, which, like so many Michael Keatons à la Multiplicity, is causing them to fade. Their mission on Earth is to create a Grey-human hybrid that can reproduce sexually, and thus perpetuate the existence of their species. Nordics: While they get their name from their resemblance to Scandinavians, these aliens actually hail from the Pleiades star cluster. 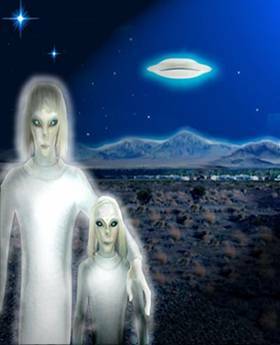 Kind-hearted, spiritually advanced creatures, Russak claims that Nordic aliens literally exist on a higher metaphysical dimension than ours. Their mission on Earth is largely that of goodwill. Tall Whites: Not that much is known about this group except that they’re tall, white, and crazy about Earth culture. While the elder entities can grow to up to 10 feet, the younger ones actually blend in quite well. “All of you have seen a Tall White at some point,” says Russak. “You usually see them,” Kundallini adds, “in casinos, theatres, and conferences.” Their favorite city? Vegas! Reptilians: While they are initially lizard-like in appearance, these creatures employ molecular shapeshifting and laser holograms to take on any form. Add powers of telepathy and invisibility and you’ve got a force to be reckoned with. According to Russak, reptilians “see the Earth as their outpost. They want complete control over it because their planet is becoming unable to support life.” Conspiracy theorist David Icke fears that reptilian humanoids are secretly transforming the Earth into a global fascist state. But, Kundallini claims, these aliens are no match for our Chi Force. Anunnaki: Who knew that the gods of ancient Mesopotamia were actually migrant alien laborers from the lost planet Nibiru? Originally sent to this Earth to mine for gold, the extraterrestrials quickly got sick of their work. Their solution, according to crypto-scholar Zecharia Sitchin, was to crossbreed their DNA with primitive humans and forge a race of slaves. In this manner, many in the UFO community believe, human civilization was born. 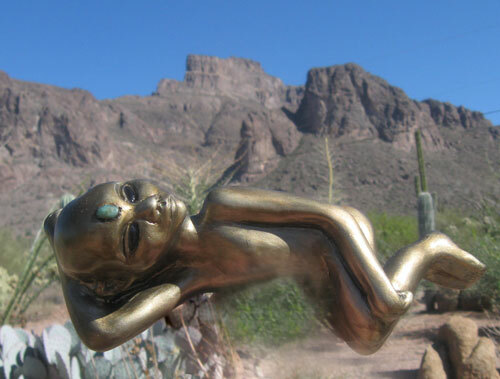 Andromedans: Energy beings from the Andromeda galaxy, these guys are so high up on the cosmic chain of being that they no longer require a physical body. Their food, according to Russak, is nothing less than truth itself. However they’re still not above meddling in our affairs. From their lofty perch aboard a giant invisible mothership somewhere in our stratosphere, the Andromedans stand guard over us Earthlings and do battle with unseen dark forces. Insectoids: Bug people! 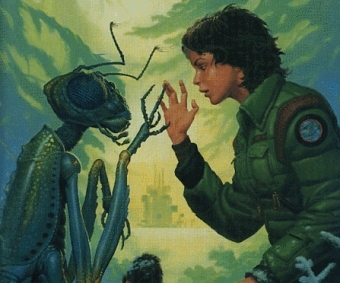 Giant, super-intelligent bugs from outer space. Now these descriptions may seem far-fetched, but according to Kundallini, who claims to have had many encounters with alien entities, spotting ETs is really just a matter of opening your mind. “If someone tells me they’ve never seen a UFO,” Kundallini says, “the question I ask is: do you want to see one?” Psychic intent is something he believes most aliens, being telepathic, can sense. So if you broadcast your willingness to be visited, they just might hear you. Many in attendance seemed to agree. James, who brought his young son to the lecture, claims to have seen countless aliens and UFOs. Just the other week he and his family spotted a couple of Greys skulking around their home. For others, technology holds the key to capturing that elusive sighting. During the post-lecture BBQ and skywatch on Russak’s back patio, a filmmaker who goes by the name Skull Man trained his camera to the overcast sky. UFO videography is a painstaking task that involves poring over hours of monotonous footage, but Skull and others maintain that it’s worth the effort. Mark, an amateur ufologist, was taking snapshots of what appeared to be empty patches of cloud cover. He explained that on further analysis strange objects might reveal themselves. A small speck barely visible to the naked eye could, zoomed in, turn out to be something totally out of this world. Mark’s photos are more likely to find their way into the National Enquirer than National Geographic, but alien believers are far from a fringe sect. A poll by Opinion Dynamics Corporation in 2008 revealed that 34 per cent of Americans believe in the existence of UFOs. Former Canadian defense minister Paul Hellyer is an outspoken advocate for alien awareness. Playing with his daughter and flipping burgers on his patio in suburban Etobicoke, Russak certainly doesn’t look like a man on society’s outer edge. Perhaps the weirdest thing about UFO culture is how commonplace it’s become. That and the—um—shapeshifting reptilians. Alien, UFOs in Outer & Inner Space is a meetup group that gathers every other Friday to discuss extraterrestrial phenomena and engage in a skywatch, weather permitting. Admission is free and open to the public.